November 12, 2018 marked the nineteenth anniversary of the enactment of the Financial Services Modernization Act of 1999, otherwise known as the Gramm-Leach-Bliley Act. The act is often associated with the repeal of the Banking Act of 1933, often called “Glass-Steagall” for short, which created prohibitions on affiliations between commercial banks and securities firms. It is sometimes claimed that Gramm-Leach-Bliley deregulated the banking system in a way that caused the crisis. In this brief post, I’ll re-examine the deregulation claim and whether it caused the crisis. In short, Gramm-Leach-Bliley may have eliminated barriers that prevented commercial banks, like Citicorp, from affiliating with securities firms, but it also came with greater regulatory restrictions and word counts in the Code of Federal Regulations (CFR), which can raise entry barriers for potential newcomers. Since the meaning of the word deregulation often varies considerably from one person to the next, before I begin, I’ll briefly explain two common uses of the word. Deregulation: What Does it Mean? On the other hand, George Stigler’s highly cited 1971 article “The Theory of Economic Regulation” suggests that deregulation concerns entry barriers into a particular industry. A key point made in the article is that firms operating in an industry may call for regulation, which limits entry by potential competitors. Regulators of such an industry are said to be captured. If true, one way to make an industry more competitive is to eliminate entry barriers. With these two definitions in hand, I can now examine whether Gramm-Leach-Bliley resulted in deregulation. Yes, it’s true that commercial banking firms like Citicorp were allowed to affiliate with securities firms after the passage of Gramm-Leach-Bliley. In fact, Citicorp had forced the issue by attempting to merge with the Travelers Group, which had itself merged with Solomon Brothers. However, the Gramm-Leach-Bliley legislation has also generated more changes to existing administrative law, through words and regulatory restrictions, which as I’ve discussed elsewhere include words such as “may not”, “must”, “prohibited”, “required” and “shall”, in the CFR. 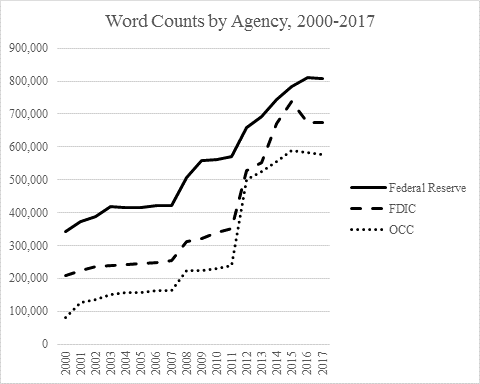 To see this, the figure below depicts the number of words associated with Gramm-Leach-Bliley that appear in the CFR for each of the federal banking regulators, the Office of the Comptroller of the Currency (OCC), the Federal Reserve and the Federal Deposit Insurance Corporation (FDIC). Note: The CFR metadata was downloaded on September 16, 2018, while the Public Law Database was downloaded on October 11, 2017 from https://quantgov.org/. The number of words in the CFR for the OCC that are associated with Gramm-Leach-Bliley increased 7-fold between 2000 and 2017 to almost 600,000. For the FDIC, the number of words more than tripled between 2000 and 2017 to almost 700,000. Finally, for the Federal Reserve, the number of words more than doubled between 2000 and 2017 to over 800,000. I can show something similar for regulatory restrictions. 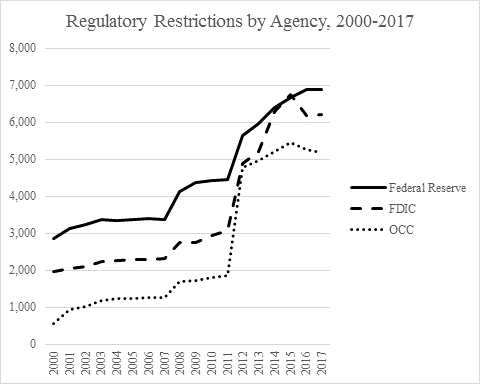 The figure below depicts the number of regulatory restrictions appearing in the CFR for the OCC, the Federal Reserve and the FDIC. The number of regulatory restrictions in the CFR for the OCC associated with Gramm-Leach-Bliley increased over 9-fold between 2000 and 2017 to nearly 5,200. For the FDIC, regulatory restrictions more than tripled between 2000 and 2017 to over 6,200. Finally, for the Federal Reserve, regulatory restrictions more than doubled between 2000 and 2017 to almost 6,900. If we use the public interest definition of deregulation, then it seems that we can reject the claim that Gramm-Leach Bliley implied deregulation. Using the “Economic Theory” definition of deregulation, while it’s certainly true that some firms may have been merged, the rise in word counts and regulatory restrictions related to the passage of Gramm-Leach-Bliley does not favor ease of entry where it concerns affiliations between commercial banks and securities firms. As I’ve previously discussed, in the run up to the last crisis, commercial banks that were involved in securitizing assets, including Citigroup, also held onto the highest rated tranches of the securitization deals they were involved in. A key reason for doing that was the so-called Recourse Rule, finalized in late 2001 after the passage of Gramm-Leach-Bliley, which lowered capital requirements for holding companies that held the highest rated tranches — commercial banks, especially larger ones tend to like operating with less capital because it increases their leverage. That rule spurred demand by these firms to hold onto the products that lay at the heart of the last crisis. Moreover, two regulations, one interim one in 2003 and one final one in 2004, affected how such deals were funded by eliminating the requirement to include this activity when banks computed their required capital. Carolyn Sissoko has discussed these changes at length. These changes help spur the supply of those assets. The graph below depicts the total volume of the products at the heart of the last crisis, Structured Finance Collateralized Debt Obligations (CDOs), which were typically backed by mortgage backed securities. While there was a slight rise in volume after 1999, the trajectory increases after the 2001 Recourse Rule and again after the 2003/2004 regulatory changes. Note: Data downloaded on May 30, 2018 from https://www.sifma.org/resources/research/us-abs-issuance-and-outstanding/. Gramm-Leach-Bliley has generated a rising number of words and regulatory restrictions in the CFR since its enactment in 1999, which speaks against the “Gramm-Leach-Bliley fostered deregulation” claim. 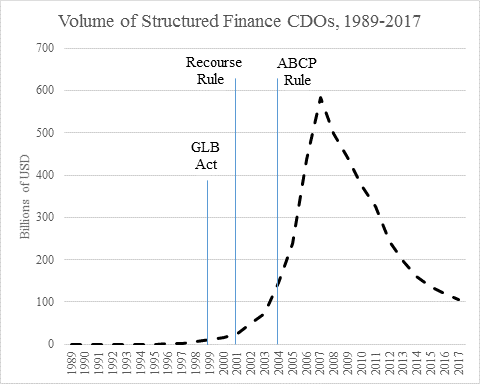 Since the last crisis concerned which financial entities held the Structured Finance CDOs that experienced extraordinary losses, Gramm-Leach-Bliley did not by itself contribute directly to last crisis. I will concede that the 2001 Recourse Rule and 2003/2004 regulatory changes may have undermined some of the promised benefits of Gramm-Leach-Bliley; after all, poorly capitalized banks, even large ones, often don’t do well during a crisis.